In this episode, I share the top ten things that I would have told a younger version of myself, based on what I know now. These running tips are things that I wish I would have started earlier or tactics that have led me to achieve the greatest gains in my running. I believe that, if you adopt even a few of these into your training, you will see great results. 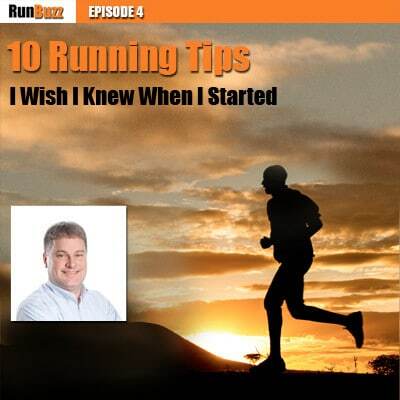 So without further adieu, here are 10 tips that made me a better runner. 1. Build a better base before increasing mileage. 2. Include preventative maintenance in your life. 3. Join a running club or running community (like the RunBuzz Facebook group), or find a running partner. 4. Don’t rely exclusively on a running club or partner to train. 5. All training programs work (this one is worth listening to in detail). 6. Slow down to speed up. 7. You are not in a competition with anyone. 8. Every workout should have an identifiable purpose. 9. Running the same pace will cause you to slow down, plateau, and mess with your metabolism. 10. Do what you can when you can. You do not need to be perfect.